There are some jars or posts displayed in the VMS. images such as on f102r, f99v, 100r, etc. 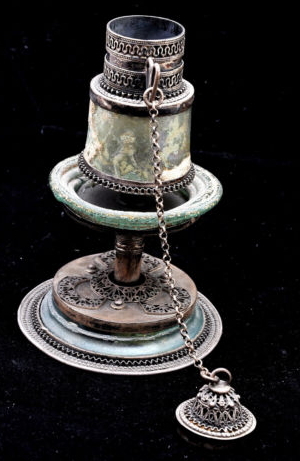 It looks like an Incense burner such as can be seen here. Or perhaps it still is the parfum bottle we once bought in Tunis. You can get everywhere in Tunis or in Egypt. Then you can see it is not from Venice. I googled some more and found out that “ancient bottles with sharp feet” led me to “bottles with pinched toes”. Several glassmaker techniques produced pinched toes. A group of fancy unguentaria made in Italy in the first century had three pinced feet, but in the west toes and feet were most often made by adding small blobs of glass. In the late third and fourth centuries, Syro-Palestinian glassmakers commonly pinched multiple small pinched toes out of a base ring. In the early 3rd century, jars were produced with three long pinched feet in Syria and perhaps also in Egypt. or google on “cairo Perfume Shop” ! seller: SPRING-NAHAL store. we are located in main street in tel aviv Israel since 1995. we are offering many products of AHAVA direct from the dead sea. Come With Roman Glass Original Certificate. the glass in these jewelry was found at different historical sites in the holyland. its origin is in the glass vessels of the ROMAN-BYZANTINE PERIOD. the rainbow coloured patina is a result of its aga. each glass fragment has a different shape,so that each ornament is an uniaqe original. So this bottle is made from found parts ? 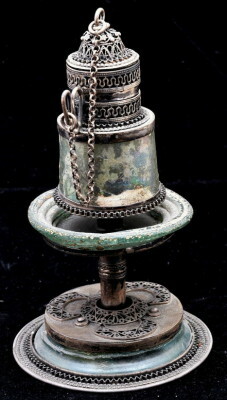 this item and the “Roman Glass Perfume Scents Very Old Perfume Bottle Over 2000 Years Ago” are listed as NEW. * its origin is in the glass vessels of the ROMAN-BYZANTINE PERIOD. this is all very unlikely. Especially the way it looks now. Where is it from and who made it ? Why do you ask around 800 USD for them ? i will be happy to answer your question if you willing to buy it. 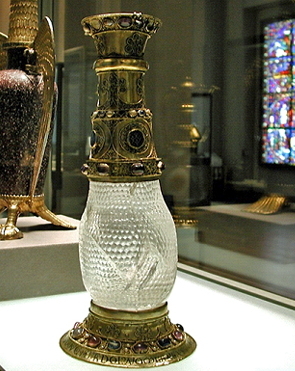 * its origin is in the glass vessels of the ROMAN-BYZANTINE PERIOD.= yes. Where is it from and who made it ?= Archaeologists found in the past the design. Why do you ask around 800 USD for them ? the original price is $1599.00 and the owner make it now for half price which is very low. the perfume was made by a Jewelry artist worker. 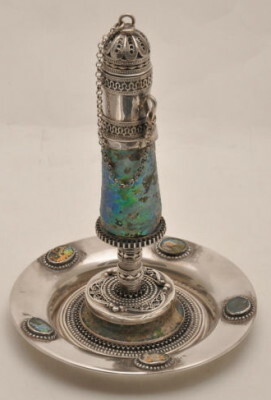 The seller claims that the glass comes from the Roman-Byzantine period. 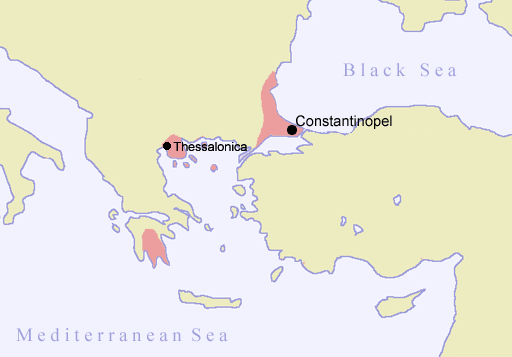 The Byzantine Empire, or Eastern Roman Empire, was the predominantly Greek-speaking continuation of the eastern part of the Roman Empire during Late Antiquity and the Middle Ages. Its capital city was Constantinople (modern-day Istanbul), originally founded as Byzantium. 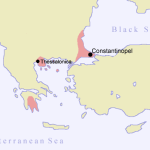 The Byzantine period: years 1261 – 1453 followed by the Ottoman empire. Since we know that when the Ottoman have conquered a place, everybody is dead and everything has been vandalized, i assume the VMS is made before 1453. Fortunately this is the exact time period of the carbon dating. As we can see the empire around 1400 is not very large. See also this map of the place before 1400, and here a map of 1453: the fall of Constantinople. There is a particular man in the USA that found this. His site and his video’s have a specific hobby character: Sukhwant Singh. 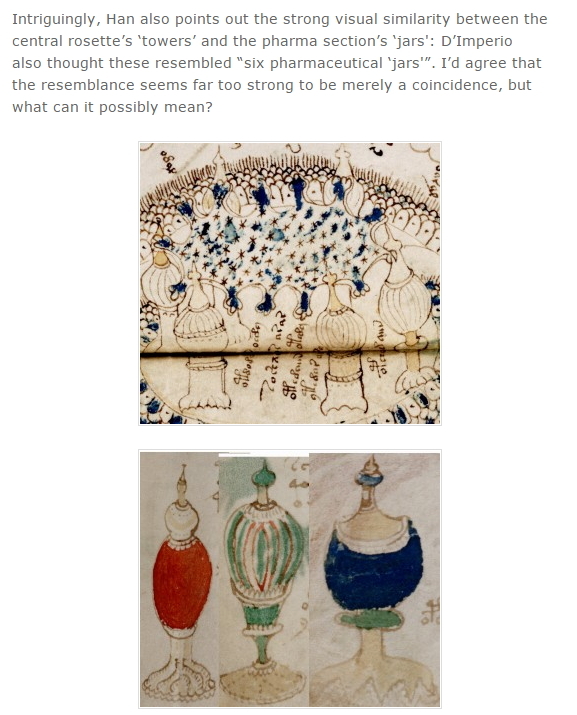 But anyway, he found the location of a Rosette drawing, and he found the containers from the manuscript. By presenting this, he also shows a the language solution that is not satisfactory to me at this point. Here are the jars/containers, they are Jandi lacquer art. This craftmanship is very old and these days indeed used to make (Charpai) table legs and such. 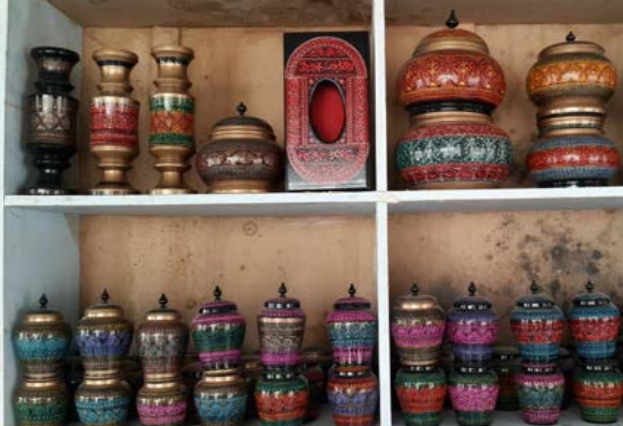 But originally that craftmanship on Jandi craft was used for jars. Resource Development Institute, Rawat, Islamabad: .. preservation and promotion of Jandi laquerware. It is a vocational training school that offers a wide variety of shortterm courses, as well as diplomas in architectural technology. This could mean the author of the VMS travelled indeed as Roma from India, as one of the two,3 or four groups (read history on the Roma) somewhere between 1100-1400. Then travelled through a particular route to somewhere around the place where the ghibelines are. I traced the ghibeline crenelations in the mentione period are the route of those is very, very long. It starts in Italy all the way up to Germany, Mainz, where the Roma arrived around 1418. It seems there are compartments, or at least there are diameter differences, from big to smaller and then bigger again. After investigating Indo-European languages i cam to the conclusion that there is a more Indian influence than an European in the script. This has led me to regions that are hard to investigate. * are these containers from turned wood (jandi) or clay pottery, or perhaps silver hammered ? These feet are very hard to find, at least in the Indo area. Yes there is porcelain in Germany, Italy, France, perhaps other countries but the VMS does not show us lacquered porcelain. And nopt really in that period. Clay objects are made by a) hand forming b) wheel-turned pottery. Earliest form of making post may have been using the coiling technique. Long strips of clay are coiled until there is a cilindrical form. Hand modelling is often used for figures but can also be used to make a pot. In India a potter is called a KUMHAR. 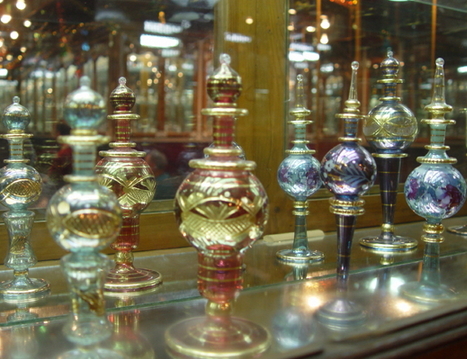 An example are the tiny oil lamps for Diwali. Clay consists of cleaned sand, silica. 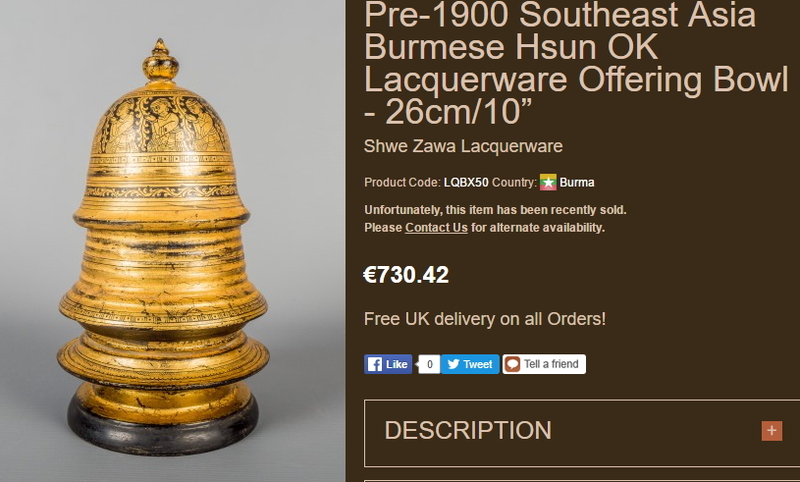 Burmese lacquerware all end in a form which has a pointed top. Also the foot is always solid and thick. Often the clay used is red of black. Multani pottery is very famous for it uniqueness and beauty , it is not only made on white clay the thing that differentiate multani pottery with others is that it is also made on red clay . .the red clay pottery of multan is in demand .the colours of pottery shows the culture and art of multan .and it is related with the historical construction and art and t and it is lasting from generation to generation the blue pottery of multan can also seen on the historical tombs of shah rukne alam and bhaudin zakria multanis . this red clay potery of multan attract forigners towards multan . 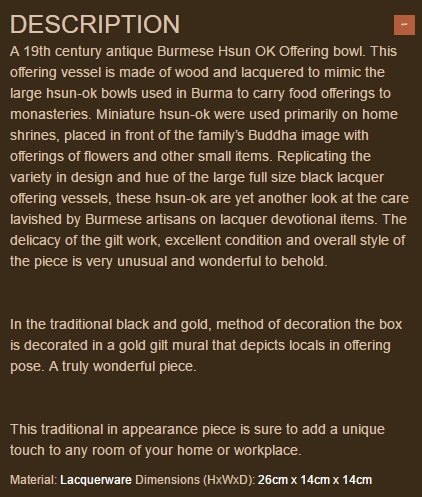 Like an offering bowl, Hsun-ok.
the ornaments could be made by etching/engraving into wood or clay, or painting. The round forms could be made by wood turning easily, or wheel turned pottery. Woodturning will always give a round edge and never a squared edge on the cylindrical shape. The feet are impossible to make using turning motion. In wood they could have been added later or carved from the solid wood itself, where the latter is very unlikely. In clay these can be made easily, however they will be very delicate and will break quicker when some force is applied to the leafed feet. However it can be done, when the clay is baked long enough or hardened with other materials. So, that is also unlikely. Traditional pottery and ornamental feet are hard to find. All the feet from wood I found have been put on later or are made as separate base. Only on the blue luxery jar on 102v2 there is a slight bumpy edge in the middle ring, but all the other containers have an outside area which is evenly flat. Typical for clay is that the mouth, or the top of the container, is slightly bend outwards such that the mouth will have some lips. These “lips” are formed with a small tool or with the fingers of the craftman and will have a specific round outward shape. On the containers nothing like that can be seen. What is also typical on clay turned jars is that there is a bulbious tendency. That can not be seen on the VMS jars. Another feature of clay turning is that the cylinder wides towards the top, middle or bottom. This is also not the case here. Often you see that with a small knife-like tool the rims of the object will get small stripes when that tool is used to flatten the rim and at the same time decorate the clay. Such a thing indeed can be seen on 99v, 3rd jar and 102r1, 2nd and 3rd jar. However as can be seen on that last jar mentioned. There are in the middle 3 edges and the striped markings are exactly on the middle edge. Such a marking is very nice, but from the clay artist point of view not a logical thing to do. Placing that on the outer rim(s) would make more sense and is a natural thing to do. Also extremely difficult to make because you can’t do it when the piece is turning. Wood turning seems logical because the shape of all 14 containers (not the luxurious ones) have a wide bottom and slightly narrowed diameter towards the top. That is typical for woodturning. If you look at the rims, that is where the chisel makes the transition to the large diameter towards a smaller diameter, you can see that rims are sometimes only one edge, but most of the time double or triple lined edges. That is applied because of the turning of the piece is not centered, or because the hand of the chisel is not steady, or sometimes the wood does not contain the same shore hardness of the wood on all places of the rounding. Then the edge does become a bit wobbly. Using wood turning would not give you a straight cylinder from top to bottom in an instance: you will need to hold the chisel at an exact distance from the tuning woodpiece, otherwise the surface will become somewhat oval or tapered. Can we see that in the VMS containers? No, the shapes are straight and not round or oval on the surface. 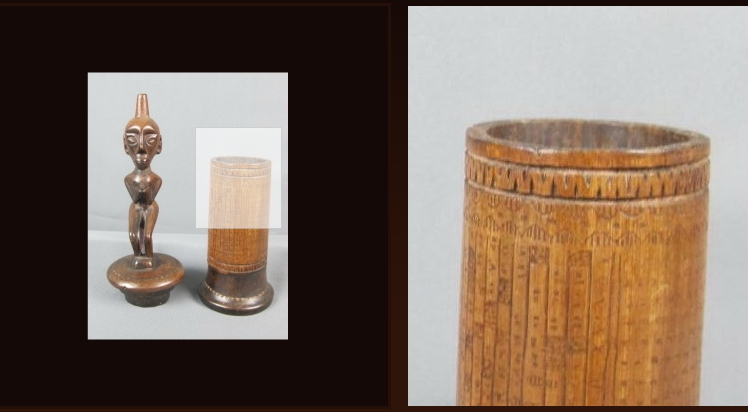 The edges of the cylinder are almost like sawn on the top, except the bottom is always rounded: it almost looks as if the bottom is sealed with something. Perhaps a sealant is used on the bottom and on the edges. If we look at the bottom of all containers and then compare the rims with that, we see similar lines. Perhaps the entire container is built from compartments with different diameters which are then sealed together with a kind of paste. For example bamboo could be used for that? Or perhaps the natural membrane from a bamboo piece is used. Also a piece of robe could be used to bind it all together. The use of different round sized containers could explain why the luxury container have so many different round levels. There are many similar containers but not found in that time and geographical location we would have liked: Italy, Austria, Germany. The containers that are alike, are all found or originate from India, or region. 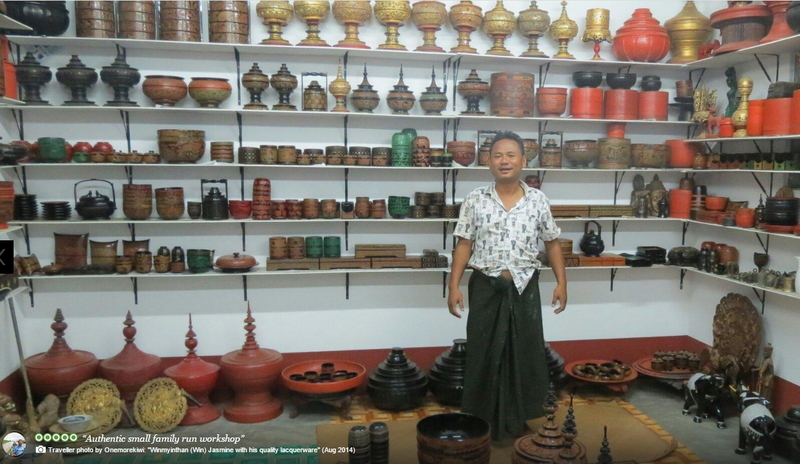 Like Burmese pottery (Myanmar), Indonesian storage of beetle, fortune telling boxes, and different other handicrafts from the “East”. In a future research I will further research the thousand language variants present in the Indo-Aryan language class. But currently this region seems a bit far fetched considering the finding place and the provenance of the manuscript.